Designer knitwear by Koyal Kapilla New Zealand. 100% Fushia Pink Merino 3 button cardigan with rolled collar. Extremely soft and warm.Lovely bright colour just perfect to little girls. Approx size - 1-3 years. Measurement: Length 33cm, Width across the chest from underarm point to underarm 34cm. 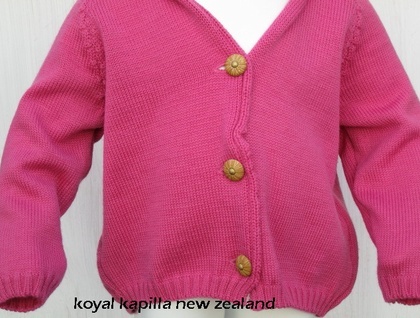 Koyal Kapilla New Zealand is designed & knitted inhouse in Auckland. Yarns used are sourced from local suppliers as well as from Europe. Request can also be made.